The tallest peak in Thailand. Although Chiang Mai is famous in its mountains and hot springs, it also has an abundance of waterfalls; some of them are highly recommended. Wachiratharn is one of a great example. Standing at a height of 80 meters and 15 meters wide, Vachiratharn is large waterfall near Chiang Mai city, producing a colorful rainbow from its spray and attracts tourists in a summer day. 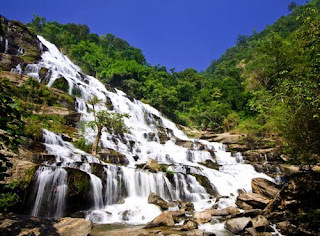 The waterfall is located in the area of Doi Inthanon National Park, away from the city about 81.2 kilometers. Follow the Route 108 from Chiang Mai and then turn right to Route 1009 at the kilometers of 58 between the town of Khuang Pao and Chom Thong, going along the way until you reach to Vachiratharn Waterfalls.